SANTO DOMINGO, Dominican Republic (CNS) — Deep economic problems and violent demonstrations in Venezuela have left Catholic charities struggling to supply food and medical supplies amid an increase in demand for services, said a top Catholic aid official. “The situation has been getting worse over the last year, but now we’re at the point where it has become very difficult for us to even find basic (food items) or to buy medications,” Janeth Marquez de Soler, executive director of Caritas Venezuela, told Catholic News Service March 10. Shortages of basic foods, rising inflation, high crime and political divisions have led to tense protests across Venezuela in the past month as opponents of President Nicolas Maduro and thousands of students have taken to the streets to demand changes. Demonstrations on several occasions turned violent, however, leaving at least 21 people dead and prompting the bishops of Caracas to issue a letter calling for calm. An related video about this story can be seen here. The letter took issue with both the government’s response to the demonstrations as well as the tactics used by protesters who have also resorted to violence. The letter highlighted the use of force by the government, calling for authorities to instruct security forces on the use of proportional force. Since early February, clashes among protesters, government security forces and armed paramilitaries aligned with the government have created tension in pockets across the country. On March 3, the principal church in Colonia Tovar, west of Caracas, was reportedly damaged during an attack. A woman, who would identify herself only as Maria, told CNS that the damage was fairly minor but that residents in the area feared further violence. The situation, however, remains protracted, exposing deep divisions across Venezuelan society a year after the death of President Hugo Chavez, whose self-styled socialism drastically cut poverty but left behind serious social and economic problems. “We don’t see another way out of the situation we are in other than serious changes to the government,” said Cristina Noboa, a university student who has participated in the demonstrations. Raised Catholic, Noboa said she’d like church leaders to take a stronger position on the side of the demonstrators. “We have thousands and thousands in the street every day. What more proof do you need?” she asked. 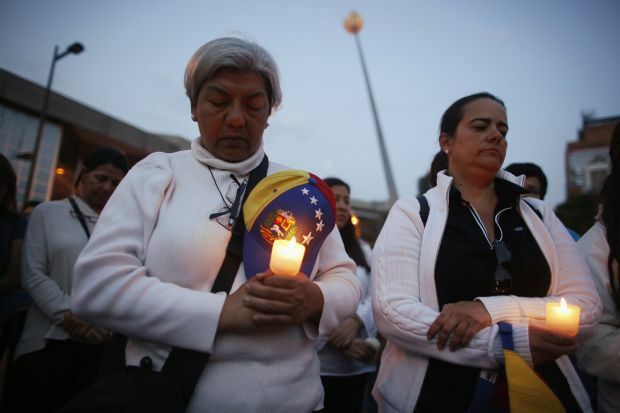 Yet, the demonstrations are not as widespread as they have often been depicted, said Jose Mejia, a seminarian who volunteers at St. Peter Claver Parish in the 23 de Enero neighborhood of Caracas. “The people here are Chavistas and supportive of the government,” he said. The parish provides breakfast and lunch to around 30 senior citizens a day, Mejia said, but that, too, has been affected by shortages of basic goods. “Food is available, but it requires waiting in line, and that’s something we hear from people across Caracas,” he said. Marquez said steep inflation — 56 percent last year, according to the government — is pushing up the cost of goods, while donations to Caritas remained flat. Marquez said the situation is grave near the Colombian border, especially around San Cristobal, considered the birthplace of the protest movement and home to the most intense standoffs. On March 9, the National Guard moved in, smashing barricades, and launching tear gas. Protesters reportedly responded by throwing stones and Molotov cocktails. A day later, a student leader was killed and two others were reported wounded by gunfire in the city of 600,000. Such violence has forced Catholic organizations to temporarily suspend operations in San Cristobal, Marquez said.